Lasagna will always be a part of my order whenever I go to a pasta of pizza place or whenever I can get one. It is hard to pass up on this layers of cheesy and meaty goodness soaked in delicious sauce. There are times that a single serving is not enough for me. At times I think, it is nice to have shops where I can take a lasagna when I want one, but it is definitely better if I can make it in my own kitchen. I always thought that to be able to create such a wonderful food, I would need to have a background in culinary arts. I thought that making a tray of lasagna is painstakingly hard and tedious. Little did I know that creating this masterpiece can be easy. With the help of the best lasagna pan and easy-to-get ingredients, you will be holding a fresh batch of lasagna taken out from your own oven. What makes the best lasagna pan? 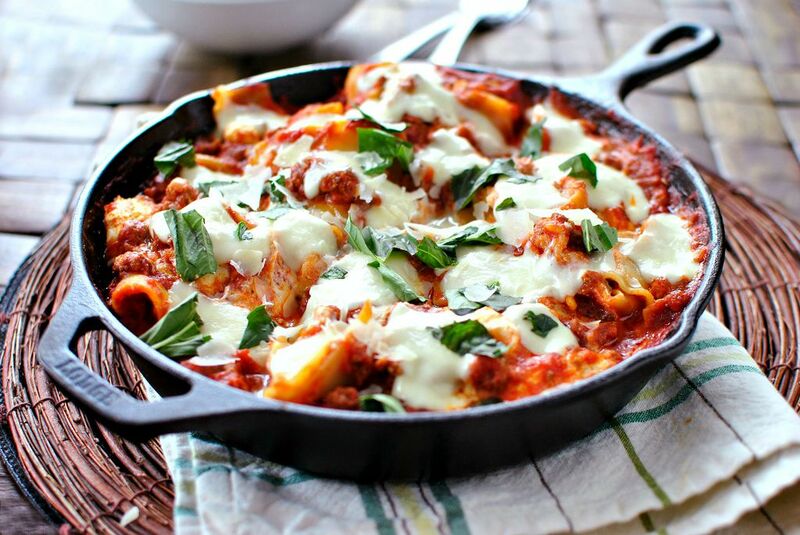 Luckily, there is not too much to consider in finding the best lasagna pan. 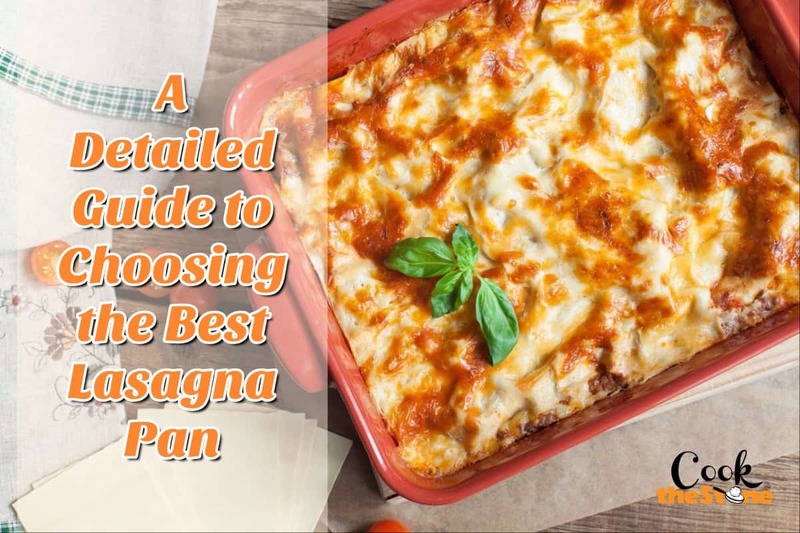 The considerations might be few, but you really need to think about what you want in your lasagna to be able to make the right choice. There are different types of materials that you can choose from. Although any of these materials can do the job, you have to know the characteristics of each that affects your finished product. Ceramic pans can do the job of cooking perfect lasagna. It heats up pretty fine and does a great job in distributing heat throughout the entire pan. However, it is not an efficient conductor and heat retention is also low. What it lacks in performance it makes up in pageantry. 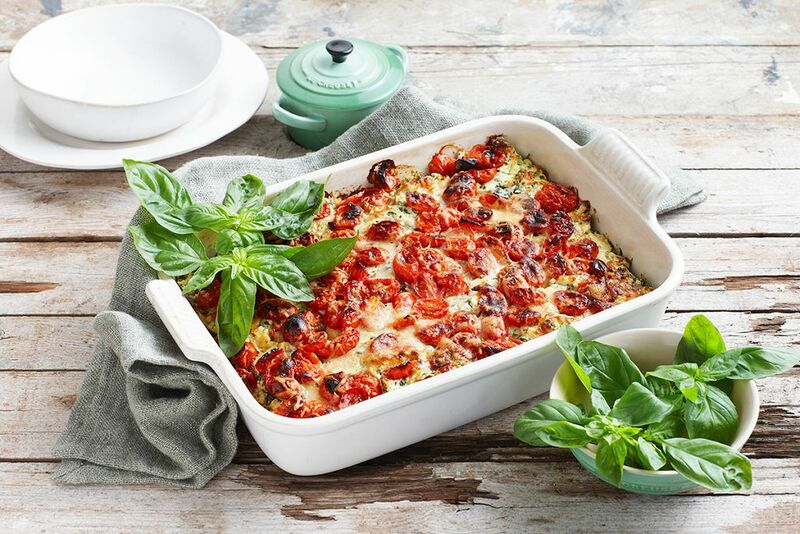 Since ceramic pans are good to look at, you serve the lasagna on it straight from the oven. Glass pans are pretty much like ceramic pans, only a little better on conducting and retaining heat albeit heating up slower. It is also better in evenly distributing heat throughout the pan. Since it has a strong heat retention, it continues to cook the food even if removed from the source of heat. It is best if you want to serve your lasagna directly from the oven. Aluminum is one of the most commonly used materials in kitchenware. This material is durable, scratch-proof and rust-proof, and is also lightweight. It is also a good heat conductor as it evenly distributes the heat to the entire tray making it cooked thoroughly. The only drawback is that aluminum reacts to acidic food, causing it to corrode and mix with the food being cooked. Aside from the metallic taste it causes, it is also harmful to the health. And by the way, tomatoes, one of the primary ingredients of lasagna, is acidic. Cast iron pans are known for its versatility and toughness. It can be used on any stove type and oven. It is also scratch proof without the need for special utensils. The drawback though, is that iron requires much care to maintain. In terms of baking, iron pans take a lot of time to heat up, it needs to be preheated for approximately 10 minutes to effectively distribute heat during the cooking process. The most preferred material to use is Stainless steel. It is beautiful, rust proof, scratch proof, heats evenly and has high heat retention. A downside is that it heats up slowly and is a poor conductor. But this issue can be solved by incorporating copper or aluminum on its base to enhance its heat conduction. Stoneware pans are also storming the market due to its durability and ability to withstand extremely high temperatures. It is also great in retaining heat so food keeps on cooking and remains hot for the longest period of time after being taken out of the oven. On the average, the lasagna pasta is about 10 inches long. A typical spread is about 7 inches wide. 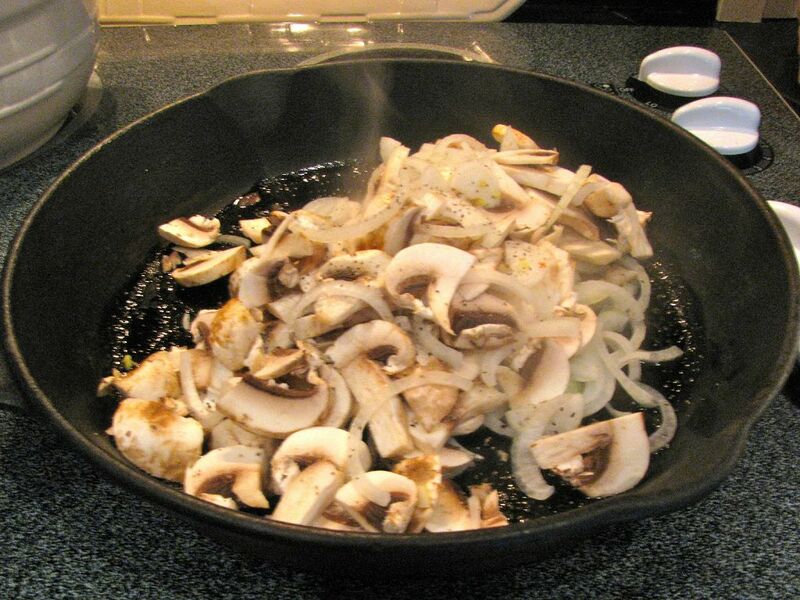 The length and width of your pan should be about 13 inches long and 9 inches wide. It allows breathing room for the pasta to be laid out and adjusted during preparation. It also allows the cheese and the sauce flow freely and generously to the sides. Aside from preventing the pasta to overlap each other, the extra 2 inches on the sides is actually for the spatula to have enough room for the first slice without little to no damage to the texture. In terms of depth, you can never go wrong in choosing a deep lasagna pan. For measurement purposes, the ideal depth is about 3 inches. But a deeper pan is still acceptable as it can serve as space for your hands to gather the pan from the oven without touching the lasagna itself, especially if your pan doesn’t have any handles. Also, with a deep pan, you can increase the stack of your lasagna, making it all the more solid and stable. ​The Deepdish, as its name connotes, is a deep lasagna pan, typically over 2 inches. You would want this pan if what you are trying to make is a really loaded lasagna, topped generously with meaty sauce and cheese. The higher the pan, the more room is available for toppings to be placed in. 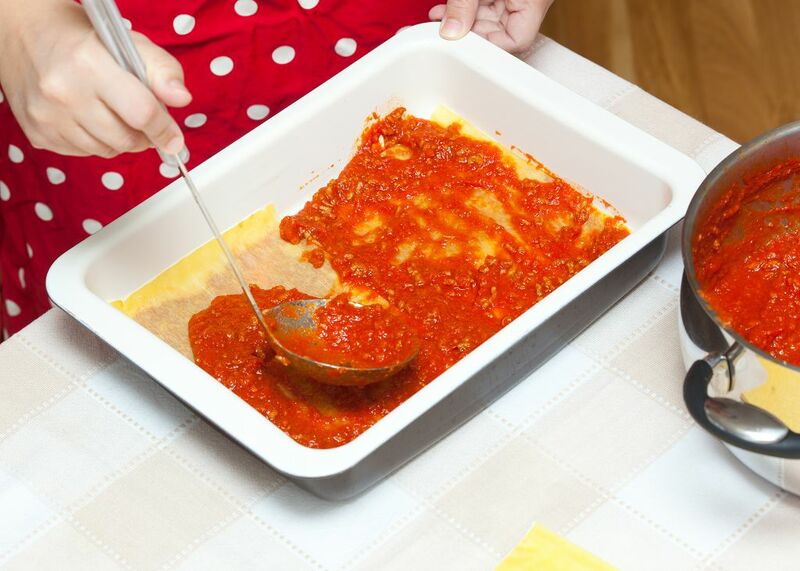 The triple compartment is a tray with narrower dimensions due to the fact that there are dividers placed across the tray that makes three slots where you can make lasagna. This is best if you want to make multiple flavored lasagnas at the same time. The roasting pan is quite larger than its counterparts. It is also more versatile as it is often used for roasts. It often comes in sturdy steel materials and with a removable roasting rack. This is the best pan to go if you tend to make lasagna in numbers or you prefer to use it to bake other recipes that require a large pan. You also should consider getting the best value for your money. Check for extra features when choosing a pan. For starters, you can check of the pan is non-stick or if it has stay-cool handles that can help you in baking. It could be a free item like a non-stick spatula or an extra roasting rack. It could also be a warranty that comes with the purchase. 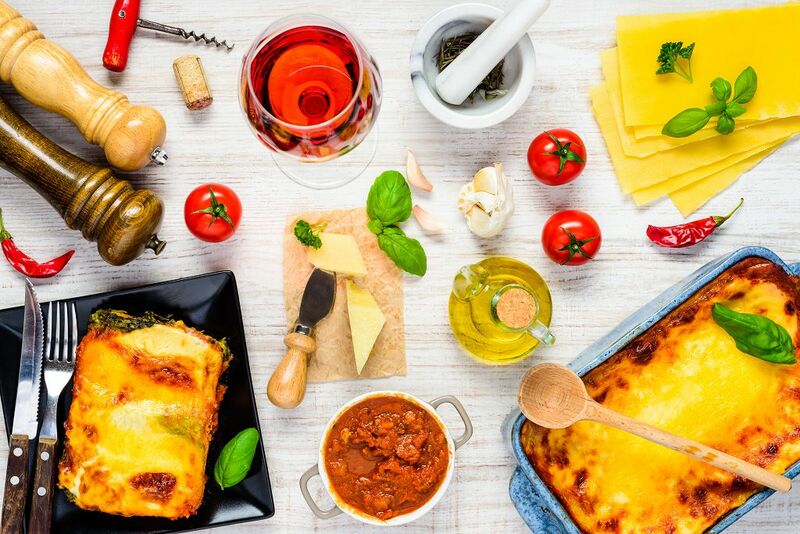 I will be giving you a detailed review on each of the best lasagna pan available today, but first, let me give you a simple lasagna recipe to start with. 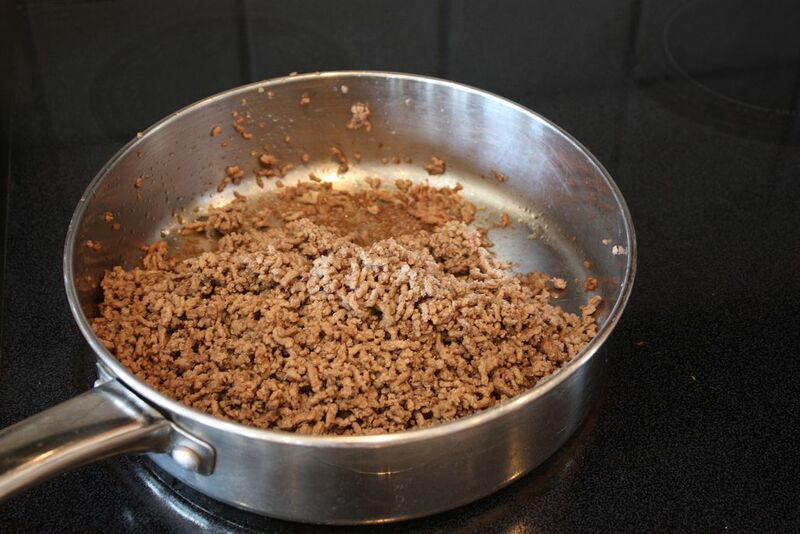 First, brown the ground beef in a large skillet then remove the grease. Stir mushrooms and onions for 5 minutes in a saucepan and then add spaghetti sauce into to simmer for about 5 minutes. Add half of the parsley, salt, and pepper in the mix as well. 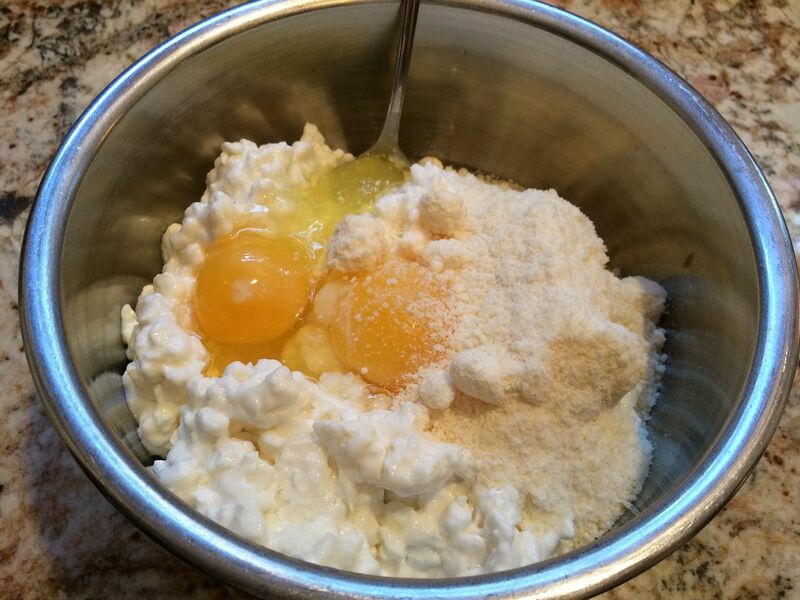 On a large bowl, mix the cottage cheese, ricotta cheese, grated parmesan cheese and eggs till combined. Spread evenly a thin layer of the meat sauce in the bottom of a 13x9 inch pan. Layer with uncooked lasagna noodles, cheese mixture, mozzarela cheese and meat sauce. Repeat the layers until all ingredients are used, save ½ cup mozzarella to melt on top later. Cover the pan with aluminum foil and bake 350°F for 45 minutes in a preheated oven. Uncover and top with remaining cheese. Bake for another 10 minutes. Let it stand for another 10 minutes before serving. 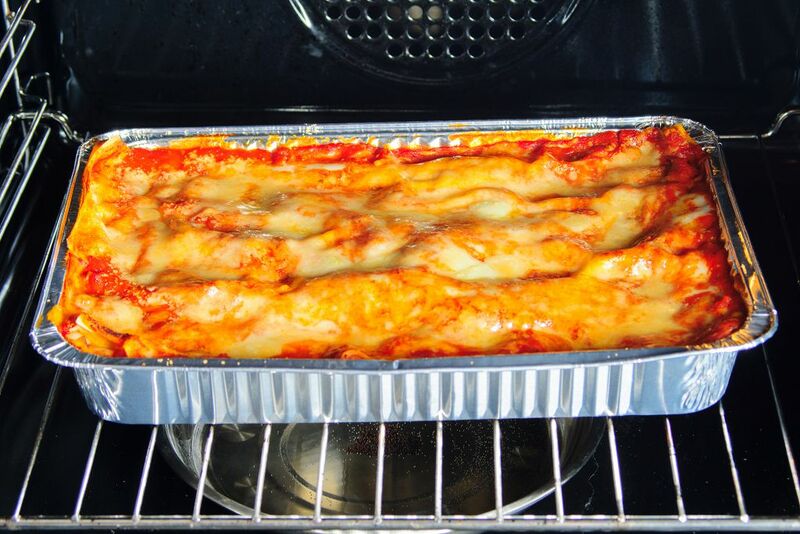 Now that you have a recipe to make, let us take a look at the best lasagna pan to cook it with. Here is my take on the best lasagna pans available today. The mirror-polished stainless steel body is elegant enough to be used for buffet tables and be served directly from the oven to the dinner table. Its riveted stainless steel side handles make it easy to handle the pan in and out of the oven. The stainless steel is nonreactive, preserving the flavor and taste of the food. It comes with a stainless steel rack, making it perfect for other baking goods as well. The mirror-polished stainless steel exterior looks elegant and beautiful, perfect for dinners and buffet tables. The stainless steel roasting rack makes the product versatile enough to be used for roasting and other recipes. The riveted stainless steel handles helps move the dish easier and safer. The pan may warp when it is not used according to instructions. This set is perfect for every occasion. It includes two different sized pans so you can make lasagna perfectly on your preferred size. It has stainless steel side handles that allow easy handling to and from the oven. You can also make roasts and other recipes with the stainless steel racks that come with the pack. Its mirror-polished stainless steel exterior is great for any gathering or party. Just take it out from the oven and serve it directly to the dinner or buffet table. It comes with two differently sized pans to choose for different using purposes. It comes with stainless steel roasting racks for roasting and other baking recipes. The stainless steel handles makes it easy to move the pans. Its beautiful exterior is elegant enough for buffet tables and special dinners. The racks are not stainless steel and are prone to rust of not taken care of properly. This piece of hardware is rock solid. It not only is safe in dishwasher but also doesn’t warp, all the while rocking its sleek polished stainless steel exterior. It is beauty and durability in one. The long loop handles make it easy to transport the pan from the oven directly to the table or buffet. It is specifically designed with rounded bottom corners for easy spatula access. Its sleek polished stainless steel exterior is beautiful enough to sit in dinner and buffet tables. It has long loop stainless steel handles with stainless steel rivets for easy access and transport of pan from the oven to the table. The single-ply polished stainless-steel construction with thick aluminum base is warp resistant and dishwasher safe. It is made of 18/10 stainless steel cooking surface which has excellent nonstick properties. It comes with free high-quality oven mitts. There is nothing to dislike about this pan. Baking the meatloaf or cooking three lasagna dishes on one go with this cookware. The best thing about it is that each compartment fits the standard measurement of lasagna noodles. A custom spatula makes the first slice easy and mess-free. It is of a nonstick steel construction and is dishwasher safe. Each compartment is of standard lasagna size, making it easy from assembly to serving. You can acquire a custom spatula for easier serving. It is nonstick for easy food release and cleaning. There is nothing to dislike about this product. It could have been better if the spatula is for free. The main feature of this cookware is its vibrant and bright colors that reflect fun and excitement in cooking. It is made of durable stoneware which is oven safe for up to 500°F. Its wide handles provide ease in transport and access during cooking and preparation. Make your kitchen and parties alive with the exciting colors. It is non-reactive to food and is oven safe for up to 500°F. Its wide handles help in easy preparation and handling of food. Since it is stoneware, the pan may chip and crack if it is not used as in the directions. The clear winner is the All-Clad 00830 Stainless-Steel Lasagna Pan with 2 Oven Mitts / Cookware, Silver. The stainless steel material is not just warp-free and durable, it is also non-stick. It is beautiful enough to sit in buffet tables and in parties. Aside from the fact that there is nothing more you could ask for in a pan, this pan is made by All-Clad, a brand synonymous with quality.